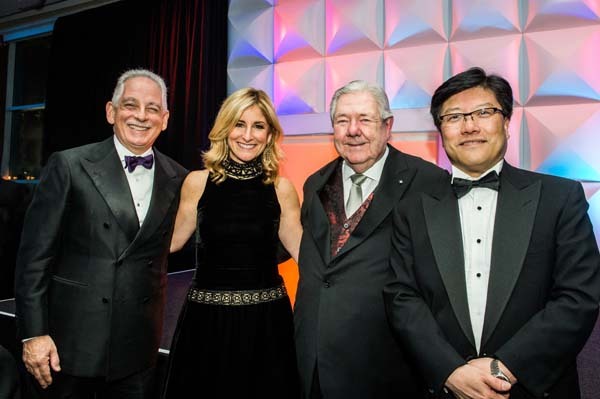 From left: Dr. Steven J. Corwin, president and CEO of NewYork-Presbyterian, Jessica M. Bibiliowicz, chairman of Weill Cornell Medicine's Board of Overseers, Frank A. Bennack, Jr., chairman of NewYork-Presbyterian's Board of Trustees, and Dr. Augustine M.K. Choi, interim dean of Weill Cornell Medicine, during the annual Cabaret benefit dinner on Nov. 9 at Pier Sixty, Chelsea Piers. The event raised $3.5 million to support the institutions' ongoing work in patient care, biomedical research and medical education. NEW YORK (November 11, 2016) – NewYork-Presbyterian and Weill Cornell Medicine’s annual Cabaret benefit dinner raised $3.5 million to support the institutions’ ongoing work in patient care, research and medical education. The event, which took place on Nov. 9, drew over 1,000 guests to Pier Sixty at Chelsea Piers in Manhattan. Guests joined event hosts Dr. Steven J. Corwin, president and CEO of NewYork-Presbyterian, and Dr. Augustine M.K. Choi, interim dean of Weill Cornell Medicine. In addition to dinner and cocktails, guests enjoyed a special performance by comedian, actor, director, writer and producer Jerry Seinfeld. The event was co-chaired by Helen and Bob Appel, Renée and Robert Belfer, Jessica and Natan Bibliowicz, Charlotte Ford, Barbara and Peter Georgescu, Peter S. and Mary Kalikow, and Ann and Andrew Tisch. NewYork-Presbyterian is one of the nation’s most comprehensive healthcare delivery networks, focused on providing innovative and compassionate care to patients in the New York metropolitan area and around the globe. In collaboration with two renowned medical school partners, Weill Cornell Medicine and Columbia University College of Physicians & Surgeons, NewYork-Presbyterian is consistently recognized as a leader in medical education, groundbreaking research and clinical innovation. Weill Cornell Medicine is committed to excellence in patient care, scientific discovery and the education of future physicians in New York City and around the world. The doctors and scientists of Weill Cornell Medicine—faculty from Weill Cornell Medical College, Weill Cornell Graduate School of Medical Sciences, and Weill Cornell Physician Organization—are engaged in world-class clinical care and cutting-edge research that connect patients to the latest treatment innovations and prevention strategies. Located in the heart of the Upper East Side’s scientific corridor, Weill Cornell Medicine’s powerful network of collaborators extends to its parent university Cornell University; to Qatar, where an international campus offers a U.S. medical degree; and to programs in Tanzania, Haiti, Brazil, Austria and Turkey. Weill Cornell Medicine faculty provide comprehensive patient care at NewYork-Presbyterian/Weill Cornell Medical Center, NewYork-Presbyterian/Lower Manhattan Hospital and NewYork-Presbyterian/Queens. Weill Cornell Medicine is also affiliated with Houston Methodist. For more information, visit www.weill.cornell.edu .